Two important pro-LGBTQ bills are under consideration in Springfield. Legislators need to hear from you on BOTH bills, and we’ve made it easy for you to send them a message. 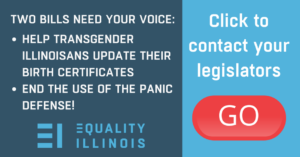 <<Click the image to urge your legislators to modernize the Illinois birth certificate law so transgender Illinoisans can live with dignity and to support the panic defense ban and protect LGBTQ people from violence. House Bill 1785 would modernize the state’s vital records law so transgender Illinoisans won’t have to have surgery in order to get the gender marker corrected on their birth certificate. Senate Bill 1761 would curtail use of the anti-LGBTQ panic defense in murder cases in Illinois. These bills will help LGBTQ Illinoisans live more equitably in Illinois. Please take action today.